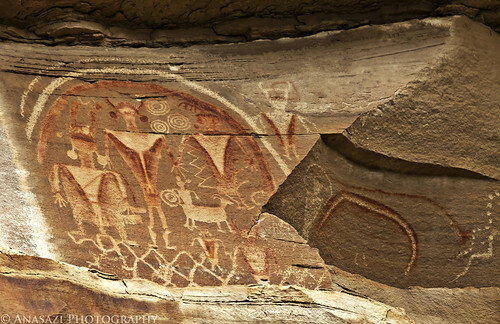 Here’s part of an amazing Fremont pictograph and petroglyph (pictoglyph) panel located in the Ferron Box of the San Rafael Swell. The panel extends to the left, but that part of it was destroyed by a vandal who left behind a layer of plaster after a failed attempt to make a copy. It’s unfortunate, I would love to have seen the full panel intact.